Neighborhoods in urban areas are constantly changing. If you combine the right architecture, adaptable infrastructure, cheap real estate, and a handful of brave souls willing to suffer through a few burglaries for the potential property value increase, anything is possible. With the right ingredients (and timing, of course), dilapidated buildings and empty streets can quickly turn into major centers of activity and commerce. This has become particularly true in recent years as a fast-paced urban lifestyle has become the go-to move for millennials. Urban developers are creating new projects with a blueprint built on millennial desires, from wine bars to cycling studios to transit-oriented apartment buildings. And while cities often get a bad rap for their noise and congestion, a surprising, powerful connection exists between urban revitalization/development and sustainability. I’ll examine that connection here by profiling three cities that have gone the extra mile to “go green” and raise the quality of life in their evolving neighborhoods. Atlanta is a city known for its suburban sprawl. In the 1960s and 70s, it became the norm to tear down historic buildings in favor of parking lots and new construction. However, generating economic development is difficult when over half of your city’s population is fleeing to the suburbs. Planners and investors became persuaded by the profitability of “silver bullet” projects (multimillion dollar developments intended to “save” an entire neighborhood from disrepair, i.e. football stadiums or casinos). These types of projects were chosen instead of creating viable, long-term plans to economically, residentially, and environmentally sustain neighborhoods in a period of severe population loss. The result? A city center full of tourist attractions, office buildings, and not much else. Atlanta became one of the most automobile-centric cities in the United States and has stayed that way. However, the city has been working to rectify their image with the recent development of the Atlanta Beltline. What started as a Georgia Tech student’s master’s thesis turned into one of the largest and most successful reuse projects in the country. 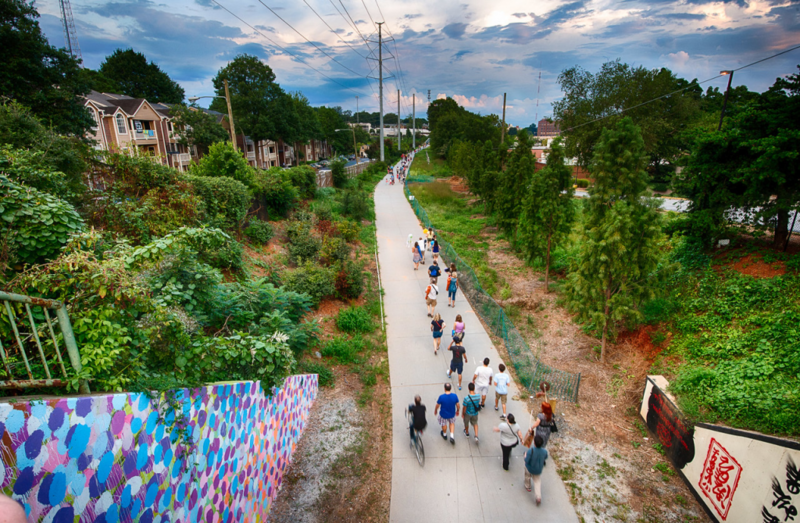 The developers of the Beltline took former railroad corridors that encircled Atlanta and reconstructed them into a 22-mile loop of multi-use trails and parks. Denser housing has popped up along the trails, lowering carbon emissions by encouraging walkability and commuting to work by bike instead of car. The Beltline has led to the construction of seven parks, plans for a modern streetcar system, free fitness classes, an arboretum, an urban farm, and the largest temporary public art exhibitions in the South. Not only that, but the trails have also encouraged over $3 billion in private economic redevelopment, turning formerly blighted neighborhoods into some of the most sought-after places to live. Atlanta is a city on the rise, and most of that is due to the economic regeneration, beautification, and sustainable green infrastructure that the Beltline has provided. In Copenhagen, what was once a polluted cesspool has turned into the watering hole and relaxation spot for city-dwellers and their families. Welcome to Copenhagen Harbor. In 1995, Copenhagen Harbor and its adjacent coastlines were fed wastewater from 93 overflow channels. 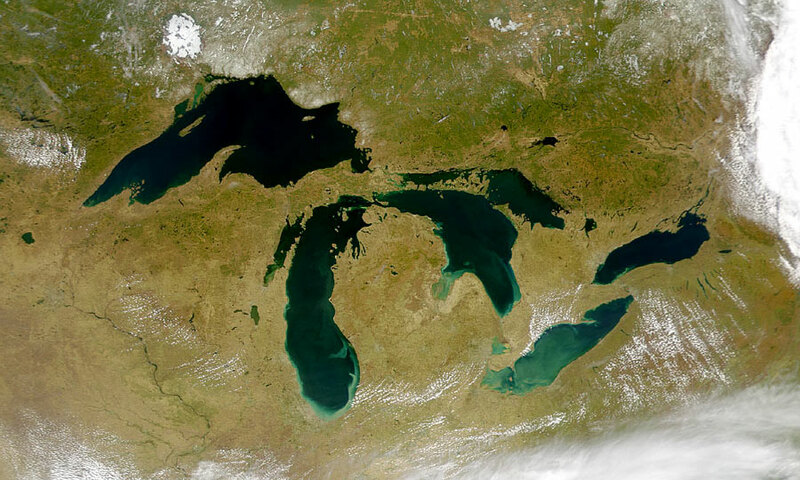 Sewage, algae, oil spills, and industrial waste clogged the water, making it not only extremely polluted but a genuine public health risk. This area seemed like it was destined to be an avoid-at-all costs eyesore forever, yet the Copenhagen municipality saw potential for action. Fast forward to 2018. The city has built numerous rainwater reservoirs and conduits, both of which can store wastewater until space opens up in the sewage system. The municipality also invested in the expansion of wastewater treatment plants and the modernization of its sewer systems, resulting in the removal of nutrient salts and the minimization of heavy metal discharge. 55 overflow channels have been closed. It is only during heavy rainfall that harmful wastewater containing pollutants is discharged in the harbor. In the few times during the summer season that this occurs, a warning system calculates the water quality in the harbor, and the facility closes down if the levels are too high. 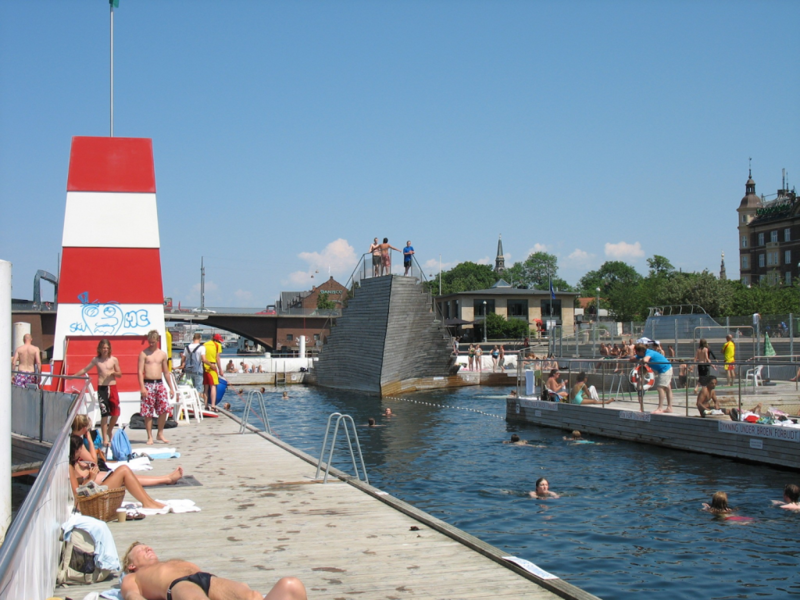 With these initiatives in place, the harbor went from no-man’s-land to the outdoor swimming hotspot and hang-out in Copenhagen. I’ve talked a little bit about how some facilities use sustainability initiatives to enhance their public image. This applies to cities as well. 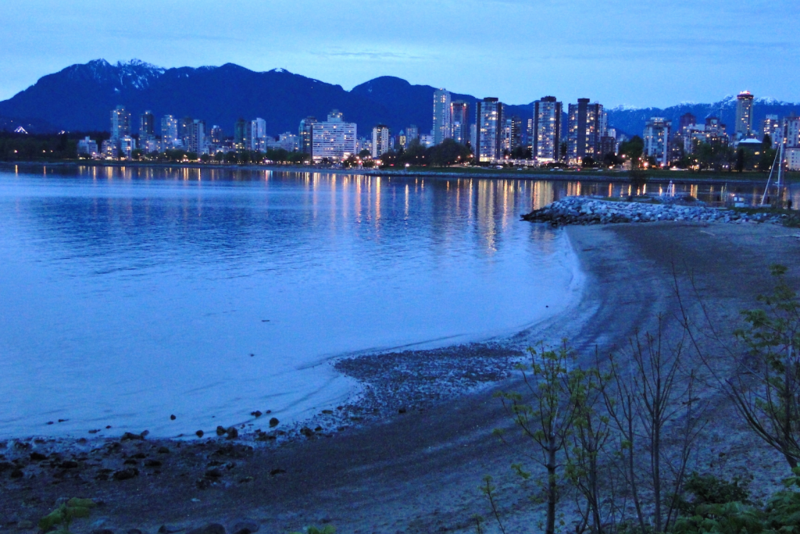 Vancouver introduced the Greenest City Initiative (a plan that’s been in the works since 2009) which outlines several specific goals in hopes of elevating the city to the greenest in the world. These goals include doubling the number of green jobs and businesses, enacting requirements for all new buildings constructed after 2020 to be carbon neutral, reducing landfill waste by 50%, discouraging water overconsumption, increasing green transportation, air quality, and access to nature, and promoting the use of locally-grown food in restaurants. Vancouver’s initiative stands out specifically in its introduction of neighborhood energy centers. These centers are intended to supply centralized/heating cooling and hot water for some of Vancouver’s most populated city neighborhoods. They make use of a mix of low-carbon energy technologies, from urban wood waste, waste heat recovered from building cooling or industrial process, geothermal heat, and sewer heat recovery. Because the centers are considerably different from the typical forms of urban sustainability projects, Vancouver has written guidelines that were created with public interest and the enabling of low carbon development in mind. These guidelines include climate protection, sustainability of fuel sources, air quality, and climate protection. The Greenest City Initiative is undoubtedly ambitious, but it demonstrates just how much sustainability practices benefit not only public health, but also the reputation of the city itself. I think that the planning of these three cities exemplify how truly versatile sustainability is. Up until now, I thought sustainability initiatives were limited strictly to the workplace and to the household. That is clearly not the case. Sustainability has the power to essentially “save” seemingly hopeless urban neighborhoods and provide a higher quality of life for their inhabitants. However, it’s not just about the economic regeneration or creation of trendy hotspots for millennials. It’s about the green infrastructure itself. Urban sustainability initiatives simultaneously help the environment while also raising awareness about the importance of an eco-friendly lifestyle. Hopefully, these examples will encourage other cities to incorporate sustainability into their development initiatives and inspire them to recognize that the creation of thriving, viable neighborhoods hinges on a healthy, green environment. For more information about green infrastructure, see the Resilient Cities LibGuide.